New England’s offensive line dominated the Chargers’ defensive line in the divisional round. The Patriots’ O-line didn’t surrender a single sack in pass protection while giving up just a handful of pressures, and they were effective all game long when it came to run blocking, especially Trent Brown from the left tackle spot. James White racked up 15 catches, but it was Julian Edelman who had the especially effective game among New England pass-catchers. Edelman hauled in nine passes against the Chargers with eight of those resulting in a New England first down. The New England defense’s tackling was a big key in the game, as they did not miss a single tackle until late in the fourth quarter. As a result, they also limited the Chargers’ yards after contact on runs and yards after catch on pass plays. Safety Devin McCourty had an impressive outing for the Patriots, as he played a big part in not allowing big plays to the Chargers’ offense after the first drive. McCourty got his hands on multiple pass attempts and was all over the field, making his presence felt against the run, as well. It was a disappointing performance from the Chargers’ pass-rush, especially by Melvin Ingram. He got hands on a ball, batting a pass down at the line of scrimmage, but notched just one pressure all afternoon, registering zero sacks or hits. Los Angeles’ secondary struggled to make plays all game. As a unit, they combined to force just two incompletions from Tom Brady (the bulk of Brady’s incompletions were off-target throws), and they also struggled to tackle in the open field. 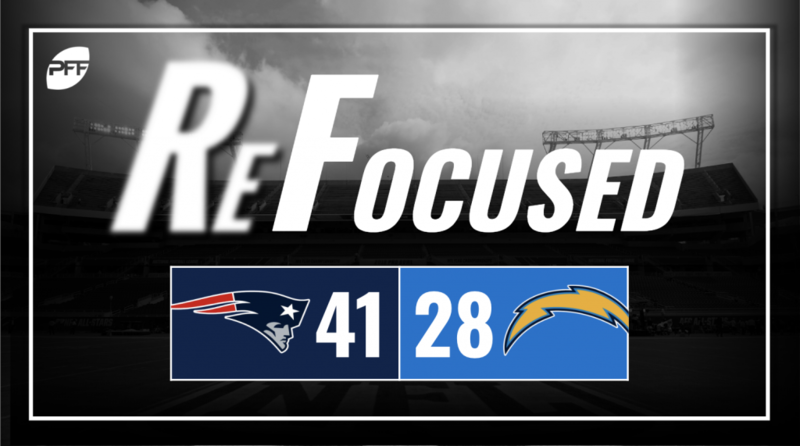 The Chargers’ offensive line did not provide any kind of help to Rivers, as they struggled mightily against New England’s defense. Though they didn’t lose too many individual battles, it was a lack of communication and discipline that hurt the Chargers’ front five. The Los Angeles offensive line failed to pick up stunts and blitzes all throughout the contest. While the box score might not show this, quarterback Philip Rivers struggled in the loss against Patriots. Most of Rivers’ production came in garbage time, and he was also fortunate to not have more than one of his passes get intercepted. The Los Angeles signal-caller had to make a lot of throws under pressure, which led to multiple inaccurate passes. New England’s offensive line set the tone from the start and continued to dominate all afternoon, keeping Brady clean in pass protection while consistently opening up running lanes for the Patriots’ backs. Los Angeles’ offensive line struggled to pick up stunts and blitzes all afternoon, which made it nearly impossible for quarterback Rivers to get into rhythm and throw from a clean pocket.